Cape Coral is a suburban community with a population of close to 200,000 residents. 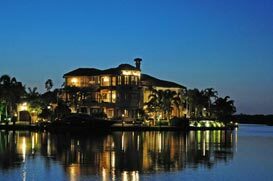 Nestled along the Gulf of Mexico and with more than 400 miles of waterfront property, Cape Coral is a young, booming suburban waterfront community with over 400,000 platted home sites. Cape Coral is a safe, friendly city with attractions such as Golf, Fishing, Boating, Sun Splash Water Park, and Beaches & Shopping.